5th Unionville Scout Group’s Venturer company is all about doing activities we have not done before. In the past, we have challenged ourselves by going on multi-day backpacking trips, canoe trips, taking scuba diving lessons, and a rock climbing night. This year, we decided to challenge ourselves by going on a winter canvas tent camping trip. Winter camping has its advantages and its respective challenges. For one, many species like bears and mosquitos would not be out at this time. Additionally, the weather conditions would act as a natural refrigerator to keep our food fresh. On the negative side, winter camping would mean we would have to dress for the extreme weather and use winter equipment to survive Canada’s harsh winter. With careful consideration of the challenges that lay ahead, we started to plan. Our Venturer Company is focused on being youth-led. Months before the Winter Camp, we made a meal plan, went grocery shopping, chose a campsite, made carpool arrangements, and obtained​ appropriate equipment. An example of equipment we would need include canvas tents, which we ended up renting. Additionally, we added a harness to the sleds that would help when transporting our backpacks to the campsite. We met up one afternoon spent approximately seven hours to modify four sleds so that it fits our purpose of harnessing it around one’s abdominal area and pulling it to lug our equipment across deep snow. Using a drill, we created holes on the edges of the black sled, then attached carabiners, PVC pipes, and harnesses. Moreover, as a team, we sat down and watched and read many videos and articles about winter camping to be thoroughly informed of all the dangers we may encounter. Evidently, there was a lot of research conducted and back up plans formulated for different scenarios. Preparation for any adventure is essential to a successful, memorable expedition. Furthermore, we had advisors giving us advice throughout the planning process. We are undoubtedly grateful for their guidance and insight which helped us stay on track. Besides that, we had to consider the cold temperature and pack accordingly. Each member of our Expedition Company would need a negatively rated sleeping bag and warm clothing for the anticipated frigid conditions. Early morning on Tuesday, January 2, 2018, we arrived in an open field in Beaverton, Ontario. We started our adventure by snowshoeing towards a forest across a barren field. The intention was to find a campsite with enough room for three canvas tents in the forest. As we were snowshoeing with our sleds secured to us like dogs tugging a toboggan of camping equipment, we started to notice the harsh low temperature with the windchill. Additionally, we noted that the snow was surprisingly deeper than we had even expected, and this was exactly the reason why the snowshoes were so significant to keep us afloat. In an hour, we reached the forest and started to look for campsites that fulfilled the predetermined criteria. 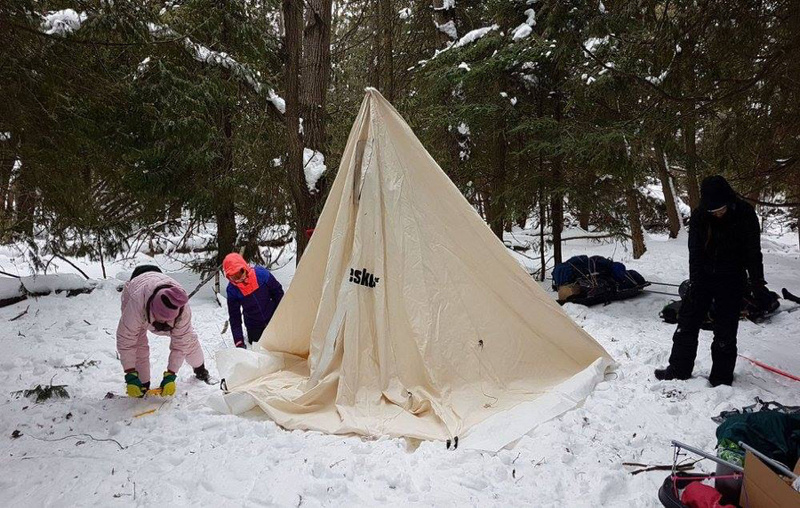 After around thirty minutes, we identified a suitable campsite that was safe from hazards, such as trees with ice hanging from the branches; we then started setting up the canvas tents. Because this was everyone’s first time using a canvas tent, it was crucial for us to be wary of how each of the three tents was set up, especially because a hot stove was placed inside of them. This was a learning experience with the new equipment which we will certainly keep in mind for the future. Once we finally set up the canvas tents properly, we started to chop and collect wood. Wood would be needed for the hot stoves in our tents which would keep us warm throughout the night. At that point, we started to collect firewood from dead trees. After lots of hard work, we successfully finished setting up all the tents and stocked up on wood within a reasonable time. At around 6:00 PM, we worried that we didn’t have enough wood. It turned out that the fire consumed the wood that had been collected much quicker than anyone anticipated. If we didn’t collect enough wood, then we wouldn’t have a fire lasting the whole night, thus, we wouldn’t be warm at nighttime. Everyone either had the role of collecting firewood or cooking. Those who were responsible for cooking had the trouble to boil snow to get water. As the night got colder, we continued to collect more wood. Despite the cold temperature that felt like it was chilly to the bone, it was not an option for us to give up. Although the process of gathering wood at night was painstakingly tedious, we persevered. One log of hardwood can burn for around thirty minutes. Throughout the night, we took turns putting in wood which left many of us sleep-deprived. Because of an extreme weather warning issued by Environment Canada, we ended our adventure early. As we left, we used the “Leave No Trace” principles that we learned in our past Scouting years to clean the campsite, so that no one would know we camped there. It was an incredible expedition that we reflect on proudly, because not many high school students may claim that they camped outside in lower than -30°C weather! This was truly an experience that was challenging and extremely tiring. Through the obstacles we faced during this laborious journey, not only did we need to overcome the physical fatigue, but we needed to conquer the mindset of trying our best and focusing on personal growth. All in all, despite the necessary action to cut our trip a little short, we left with a complete experience of winter camping in Canada.